The report offers specific details on the partnerships, analyses, and investments that government, private sector, and university stakeholders can undertake right now to enable the prompt and safe development of this nascent field with the potential to revolutionize medicine. Based on the potential for patient-specific applications, 3D Constructs, including Organoids, Scaffolds, and Printed Tissues were selected as a key platform technology. 3D constructs are predicted to be a critical component of cell-based therapies for tissue- and organ-based regenerative approaches. The resulting three-dimensional structures can be used for the treatment of congenital conditions, and can treat tissue loss due to cancer or trauma. Given the inherent process management challenges encountered when manipulating cells and biological tissues, the development of stable, consistent and safe Biomanufacturing Processes is a key platform in Regenerative Medicine. Improvements in cell harvesting, cell processing, and preservation technologies; each directly affecting the supply of materials to the production process, and therefore requiring high-level management. The report draft was released online in December 2015, with the final version released in July 2016. Regenerative Medicine has the potential to be a game-changer for patients who have damaged tissues or organs due to untreatable diseases, injuries, and congenital conditions. Lab-based innovations have shown great promise in restoring structure and function, but to deliver treatments to large numbers of patients in a clinical setting, new tools and technologies are needed. 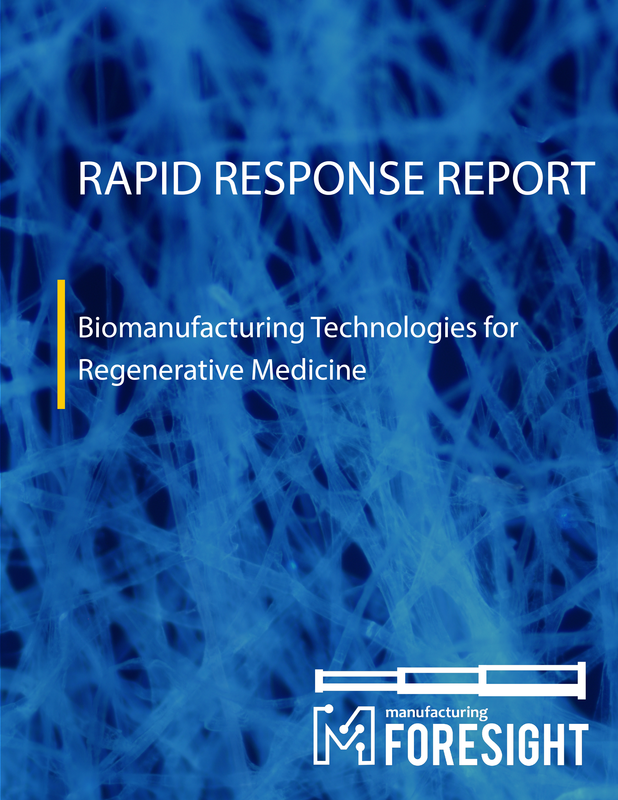 Regenerative Medicine is a new area of medical research that seeks to automate and scale-up the production and deployment of these groundbreaking solutions. The technologies discussed in this report are intentionally pre-competitive, meaning that the Federal Government may choose to play a role in additional growth via well-informed initiatives. Governmental support can come in the form of additional research & development (R&D) dollars that are magnified by private co-investment, or can be in the form of non-pecuniary actions such as modifications to the regulatory environment to better support this rapidly changing field. Ideally, a cooperative relationship between government and private industry will result in cross-industry, pre-competitive tools that decrease development cost and time while still respecting individual intellectual property ownership within a competitive environment. This report identifies promising biomanufacturing platforms that will provide a foundation for the automation and standardization of the processes associated with successful scale-up and scale-out. Dr. Eytan Abraham heads up the Cell Therapy Research & Technology (R&T) group at Lonza, Inc. in Walkersville, MD. Dr. Abraham’s R&T group develops and tests enabling technologies and methods to facilitate large scale cell therapy manufacturing for allogeneic and autologous clinical trials and commercial use. One major R&T initiative is the use of bioreactor platforms to produce large numbers of various cell types to meet cell therapy commercialization need; while maintaining high-cell quality and reducing costs. Previously Dr. Abraham was the Head of Product Innovation at Pluristem Therapeutics. This group developed a pipeline of MSC therapies tailored for different clinical indication, by altering various aspects of the 3-D bioreactor culture environment. Dr. Abraham holds a Ph.D. in developmental biology from the University of Maryland Biotechnology Institute and conducted his post-doctoral training on tissue engineering and cell therapy at the Harvard-MIT Biomedical Engineering Center (HST) and Harvard Medical School. Tim Bertram is the CEO and General Director of RegenMed Therapeutics, a clinical-stage biotechnology company focusing on a breakthrough cell-therapy to delay or prevent renal transplantation / dialysis. Past experiences include President Research & Development and Chief Science Officer for Tengion, a tissue engineering and cell therapy development company, and various senior executive positions in the pharmaceutical industry including Pfizer, SmithKline Beecham Pharmaceuticals, and Procter & Gamble Co.
Post academic experiences included time as an invited scientist to the National Institutes of Health, faculty member at University of Illinois, and faculty advisor to academic institutions in the U.S. and Europe for research and training program development. Multiple patents and peer reviewed publications relating to cellular therapeutic and tissue engineered product development. He has established 4 commercial-scale development acquisitions/partnerships bringing regenerative medical technologies into the regulatory development paradigm in the U.S. and Europe, and was involved in the registration and commercialization of 8 medical products currently on the market. Ian Harris is the Product Development Team Leader for CNTO 2476, which is the lead allogeneic cell therapy product for geographic atrophy secondary to age related macular degeneration and is responsible for manufacturing development, mechanism of action aspects of the CNTO 2476 program. Ian joined the Johnson & Johnson (J&J) family of companies in 2000 and has held various positions of increasing responsibility within the area of cell-based therapeutics. Prior to joining J&J, Ian was a laboratory leader at Beiersdorf in Hamburg, Germany, developing skin care products. Ian has a Ph.D. in biochemistry and molecular biology from University of Leeds, UK where he studied wound healing and developed cell therapies for treating venous leg ulcers and burns. Sandro Matosevic, Ph.D., is Director of R&D at Akron Biotechnology, LLC, a company that develops, manufactures and markets bio-tools and high-end cell culture products under cGMP for the Regenerative Medicine industry. Dr. Matosevic is responsible for the discovery and development of a range of novel cell therapy products and technologies: from recombinant proteins to cryopreservation media. His expertise is focused on the areas of bioengineering, microfluidics, liposomal delivery systems, recombinant protein production, novel cryopreservation media, synthetic biology and stem cell and tissue engineering. Dr. Matosevic also holds a position on the Communication committee at the International Society for Cellular Therapy, and is adjunct professor at the Department of Biotechnology at Palm Beach State College. Dr. Matosevic holds a Ph.D. in Biochemical Engineering from University College London. He carried out his postdoctoral training at Department of Chemistry at The Scripps Research Institute. Dr. Anthony Ting is Vice President of Regenerative Medicine and Head of Cardiopulmonary Programs at Athersys, Inc. With more than 25 years of experience in cell and stem cell biology, he has been a key leader in the Regenerative Medicine division at Athersys for the past 14 years. He has both clinical and scientific expertise with the translation of adult stem cell therapies and has been responsible for all development stages of bringing MultiStem, an allogeneic adult stem cell, from the bench to the bed. Currently, he is the PI on an NHLBI-funded Phase II clinical trial for AMI with MultiStem and the project lead for a TSB-funded Phase I/II clinical trial for ARDS with MultiStem. Prior to joining Athersys, Dr. Ting was a Principal Investigator at the Institute of Molecular and Cell Biology at the National University of Singapore where he established a drug discovery program. Dr. Ting received his B.A. from Amherst College, a Ph.D. in Cell Biology from Johns Hopkins University and conducted his post-doctoral training in Molecular and Cellular Neurobiology at Stanford University. Phil Vanek is General Manager of GE Healthcare’s Cell Therapy Technologies business, a business initiative funded in part by GE Healthymagination, a $6 billion strategy to revolutionize the world’s health by improving the quality, access and affordability of care. Prior to joining GE, Phil was Head of Innovation for Lonza’s Pharmaceutical division. Phil’s career has included a number of senior innovation, business and market development roles at Becton Dickinson, Invitrogen, and Life Technologies, as well as two start-up biotechnology companies in the Washington, DC area. Phil is an active member of the Alliance for Regenerative Medicine, where he currently serves as an Officer of the Executive Committee. Phil has also been recently elected to the Centre of Commercialization of Regenerative Medicine (CCRM) Board of Directors in Toronto, Canada, and serves on the Editorial Board of Cell and Gene Therapy Insights. Dr. Kaiming Ye is a Professor and Department Chair of Biomedical Engineering at the Binghamton University, State University of New York (SUNY). He was Program Director at NSF before joining Binghamton University. He is one of the most accomplished leaders in the field of Medical and Biological Engineering. He is Fellow of the American Institute of Medical and Biological Engineering (AIMBE) and Senior Member of IEEE. During his tenure at NSF, he managed neuroscience and cell biomechanics funding program and was member of a number of interagency working groups including Interagency Working Group for Neuroscience under the Office of Science and Technology Policy (OSTP), Multiagency Working Group for Tissue Engineering and Regenerative Medicine and DARPA Government Oversight Committee. His research interests include 3D bioprinting, advanced biomanufacturing, stem cell engineering, regenerative medicine, imaging and vaccine development. He is best known for his creative works in 3D differentiation of human pluripotent stem cells into clinically relevant cell lineages and development of fluorescent nanosensors for continuous glucose monitoring. His research has been continuously supported by NIH, NSF, JDRF, ABI and industry funding. He has chaired and co-chaired a number of international conferences and has been invited to deliver keynote/plenary speeches in numerous international and national conferences. He serves as Editor-in-Chief, Executive Editor, Associate Editor, and member of Editorial Boards of 13 journals. Dr. Jiwen Zhang is a Senior Regulatory Affairs Director at GE Healthcare (GEHC), leading regulatory strategy development for Cell Technology and Biotechnology. Before joining GEHC, she had worked in the pharmaceutical industry at companies including Centocor/Johnson & Johnson, Merck & Co., Wyeth Pharmaceuticals, and Sanofi-Aventis, where she led regulatory strategy development for both marketed products and development compounds in multiple therapeutic areas. She is currently leading various industry initiatives through Alliance for Regenerative Medicine, International Society for Stem Cell Research, ILSI Health and Environmental Sciences Institute, and International Standards Organization (ISO). She is on the steering committee for the FDA/CDER CiPA initiative (Comprehensive in vitro Proarrhythmia Assay), and co-chairing the human stem cell derived cardiomyocyte work stream. Dr. Zhang obtained her Bachelor of Science degree in Biology from University of Science and Technology of China and her Ph.D. in Neuroscience from the joint Physiology and Neurobiology program at Rutgers University and University of Medicine and Dentistry of New Jersey. Claudia Zylberberg, Ph.D., serves as Founder and Chief Executive Officer and President of Akron Biotechnology, LLC, a company that develops, manufactures and markets bio-tools and high-end cell culture products under cGMP for the Regenerative Medicine industry. Dr. Zylberberg co-founded Akron Clinical, today CTIFacts Latam a clinical CRO specializing in cell therapy clinical trials in Latin America. She also co-founded AssureImmune, a family stem cell bank that engages in R&D of cell therapies for the use of adult stem cell. Dr. Zylberberg is affiliated with the International Society for Cell Therapy (ISCT) and holds many nonexecutive positions: Board Member and Scientific Advisor, Alliance for Regenerative Medicine (ARM); Board Member, BioFlorida; Board Member, Palm Beach State College; and Chair of Industry Advisory Board, West Palm Beach, Florida. Dr. Zylberberg holds a Ph.D. in Biotechnology from the University of British Columbia and University of Buenos Aires and has over 30 years of experience in the international biopharmaceutical industry. Her expertise is focused on the areas of recombinant protein production, human-derived blood products, stem cell banking and new cryopreservation media.